Super Worm Moon: Why is the equinox moon special? WATCH: Super Worm Equinox Moon - What is it and how does it happen? There's going to be an extra special supermoon on the night of March 20. It's particularly special because it's also the Spring equinox, where the length of daylight is practically the same as the length of night time. 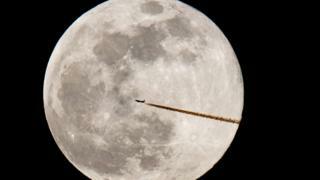 In this case, the supermoon is also called a 'Super Worm Equinox Moon'. Check out BBC weatherman Ben Rich explain why it's so important in the video above. What is the 'dark side' of the moon? What is a Super Worm Equinox Moon? The worm moon is the name given to the first or only full moon in March. It marks the end of winter - literally, in this case, as it falls on the 2019 Spring equinox , which is also really rare. While we get a Spring equinox every year, the coincidence of a full moon with the spring equinox is much rarer, as it happens only once every 19 years. It's given the name "worm moon" because the end of Winter is when little creatures like worms resume squirming out of the ground and getting eaten by birds. Supermoons happen when a the Moon is closest to the Earth, appearing bigger and brighter than normal - up to 15% brighter and 30% bigger than regular full moons. When you put that all together, you get SUPER WORM EQUINOX MOON. Spring Equinox 2019: Why are nights and days different lengths over the year? Winter solstice: What is it?